A health worker sits with a patient to assess what’s the best course of action. USAID works to deliver high-impact health care to families in both rural and urban areas. USAID partners with the Ministry of Public Health (MoPH) of Afghanistan and local partners to make quality basic health care services accessible to Afghans across the country, especially women and children. 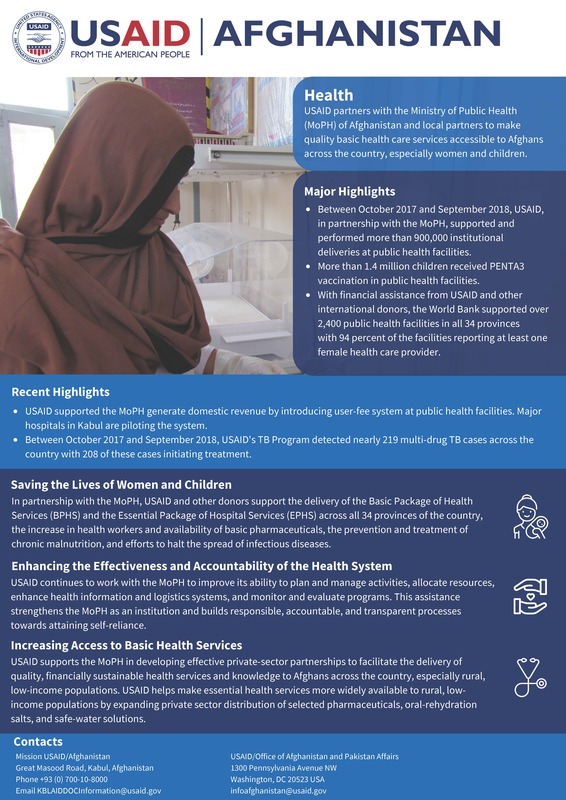 Between October 2017 and September 2018, USAID, in partnership with the MoPH, supported and performed more than 900,000 institutional deliveries at public health facilities. More than 1.4 million children received PENTA3 vaccination in public health facilities. With financial assistance from USAID and other international donors, the World Bank supported over 2,400 public health facilities in all 34 provinces with 94 percent of the facilities reporting at least one female health care provider. USAID supported the MoPH generate domestic revenue by introducing user-fee system at public health facilities. Major hospitals in Kabul are piloting the system. Between October 2017 and September 2018, USAID's TB Program detected nearly 219 multi-drug TB cases across the country with 208 of these cases initiating treatment. In partnership with the MoPH, USAID and other donors support the delivery of the Basic Package of Health Services (BPHS) and the Essential Package of Hospital Services (EPHS) across all 34 provinces of the country, the increase in health workers and availability of basic pharmaceuticals, the prevention and treatment of chronic malnutrition, and efforts to halt the spread of infectious diseases. USAID continues to work with the MoPH to improve its ability to plan and manage activities, allocate resources, enhance health information and logistics systems, and monitor and evaluate programs. This assistance strengthens the MoPH as an institution and builds responsible, accountable, and transparent processes towards attaining self-reliance. USAID supports the MoPH in developing effective private-sector partnerships to facilitate the delivery of quality, financially sustainable health services and knowledge to Afghans across the country, especially rural, low-income populations. USAID helps make essential health services more widely available to rural, lowincome populations by expanding private sector distribution of selected pharmaceuticals, oral-rehydration salts, and safe-water solutions.